LAX18 - for search code and providing the need pieces for the shell, Also giving me idea and features!!! PT - For making ICE !!! & Helping with Saving code and teaching me how to store values into Lists..
BeckAdam - For helping LAX18 with Search Code and much more . MateoC - For Making Cesium !! and inspiring me !!! EscherLochran - Making the Amazing Default sprite Icons!! Right Now it's in its Beta stages I am looking forward to releasing this Shell. I need to add more things such as more settings and pointers for ram and Rom. I'm getting close to releasing the Beta version of Xenon but i have some few thing I have to do. make shell have a slick new design. Allowing users and developer to have full control over there shell. Please PM or Post any features that will be useful for Xenon. I will also keep an update on this post. Please Leave A comment or suggestion . Lol I initially thought this was a remake of the classic arcade shooter, but not to worry - Imagine playing a remake of Xenon IN Xenon though . Looks very slick and responsive, I hope people adopt this project! 0x5 I initially thought this was a remake of the classic arcade shooter, but not to worry - Imagine playing a remake of Xenon IN Xenon though . Thank you . very much, For the complement. Wow that's cool! Looks feature-heavy which I'm all for. Keep it up! Is there any way that you can make it so that this opens from startup rather than having to open the prgm menu? I just feel that it would be a lot nicer to have this open, instead of opening this to open another program. I've been skeptical of your projects before, but this time it looks really good! The Cesium-like interface looks very good. One thing I'm wondering is why haven't you updated your calculator to OS 5.3.0 yet? You no longer need the Asm( token. Rohan: as far as I know, you can't run a program at startup on the CE like you can with the older TI 84 models. I'm not sure what's different, but it's not possible right now. However, Alvajoy could implement some hooks like Cesium does and have the shell open immediately when you press something like [on]+[prgm] which is the next best thing. Thank you ckosmic !! . I look forward to adding more features, and release the first beta version. rohanmodi, There is a way to make my shell into an os so it can open on start up, using FreeOS made by MateoC. but it's in a different program language "asm" . I also think there is a way to open the shell on start like the way cesuim locks you calculator . But, I look forward to adding [on] + [prgm] hook with the help of LAX18 and PT_, so you don't need to go to the prgm menu . I was using Cemu and I had an old Tios version on my PC. I also wanted people with an older version of Tios to know how to open the shell up . I could make this a shell into a app but I think I have to reprogram the whole shell in C . I also thing that I should wait until the shell has no more bugs then I should turn it into a app. "Could you add a hex viewer for programs and app vars?". I can but not in this beta release, I will also ask BeckAdam to help with adding this feature. Please make sure to post your ideas or wanted features!! 1). You said you cannot use FreeOS because it is in asm. I am not well versed in any language besides TI-Basic (And even then, I am not an expert on that either), but don't you need to use the asm( command if you want to use an ICE program? 2). 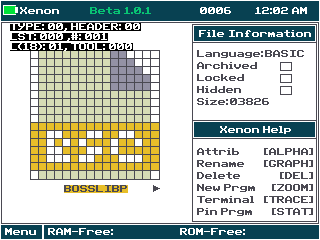 If you where to make a TI-Basic Program on the physical calculator (I do this a lot during math class), would it automatically show up in the Xenon interface? 3). I saw in the screenshots something about admin users, does that mean you can password-protect it? 4). Would the 'home screen' be like Doors CS or like a Kindle's swipe interface, or something completely different? 5). Is there a way to customize the icons for the programs? 1.) You will need the Asm( command when you are trying to run an ASM program or ICE program. 2.) 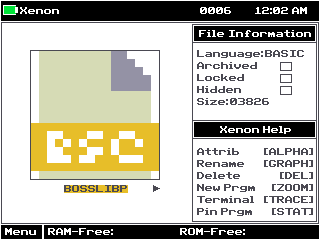 Yes, The program will show up in the Xenon UI, Also it Xenon has the ability to make new programs but not edit the program at the time . 3.) Yes, The Xenon can lock itself when you click logout in the Xenon menu . if you forgot you password you will have to download the password removal program . I Also added hints basically the length of you password. 4.) Right now am not sure. I will make it up as I go . Edit: "I would do Kindle's swipe UI, but i don't have enough space ." 5.) Yes, there is but for you have to change it with Shell source code. Edit: "Changing the Sprite Code, and can end up with Xenon Crashing. " What do you mean "you don't have enough space"? The kindle UI is really simple and you have plenty of on-screen space if you slightly reduce the icon size. You don't even have to animate it, just show what is next in the list. That's true I will try that!!! . And I will inform you of any problems with this GUI update . hopefully I can give you credit for this . Due to Mid-Terms this project will be paused until Tuesday. "I am trying to get a good grade and study hard." You don't need to add [Paused] in the title when the project is only a few days delayed. Anyway, this looks really nice! 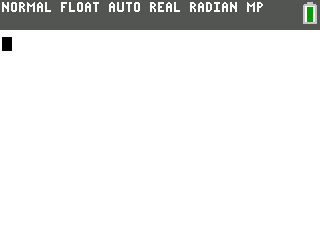 How hard was it for you to add running BASIC and assembly programs? Or did you just stealcopy someone's else code? I'm curious about how this project turns out, and I wish you best of luck! Anyway, this looks really nice! How hard was it for you to add running BASIC and assembly programs? Or did you just stealcopy someone's else code? I'm curious about how this project turns out, and I wish you best of luck! I hope you do well on your midterms . Do you have an estimated time frame as to when XENON will be completed? This month, this year, in 5 years? Looking forward to its release, will be sure to install it when it comes out. Thank you . I passed all of my mid-terms with a 90's and above, Also mid-Terms are now over. I'm getting close to releasing the Beta version of Xenon but i have some few problem and I would like some help from Cemetech ICE programmer. Allow you to have Pin a Prgm into the Menu. View value of rom and ram pointers . will this shell have folder support? It will have the folder function.. But not in the beta version, which is the current. 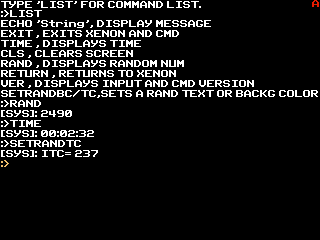 * I have removed some commands due it being not important such as "return" and "rand" where removed to make space for better commands. such as "run"
This command is related to the python import command. I am trying to find a way to transfer program data to the terminal so it will run users commands. so far there has been no luck. Please refer to the first post to view and to see what I am working on. Also, I will be posting more screenshots soon.. There are 194 users online: 10 members and 184 guests. © Copyright 2000-2019 Cemetech & Christopher Mitchell :: Page Execution Time: 0.100143 seconds.